Six years ago, Nintendo put out the oddly named and motion-based Wii console. Back then, it was a curious piece of hardware that begged players to get off their butts and valid the existence of mimes around the world, swinging at imaginary tennis balls and throwing punches at cartoon avatars until they crumpled into disturbing heaps of human paralysis. It also released during that fuzzy-time holiday season, so parents and children could come together in their festive sweaters to punch avatars into paralyzed heaps as a familial tradition. 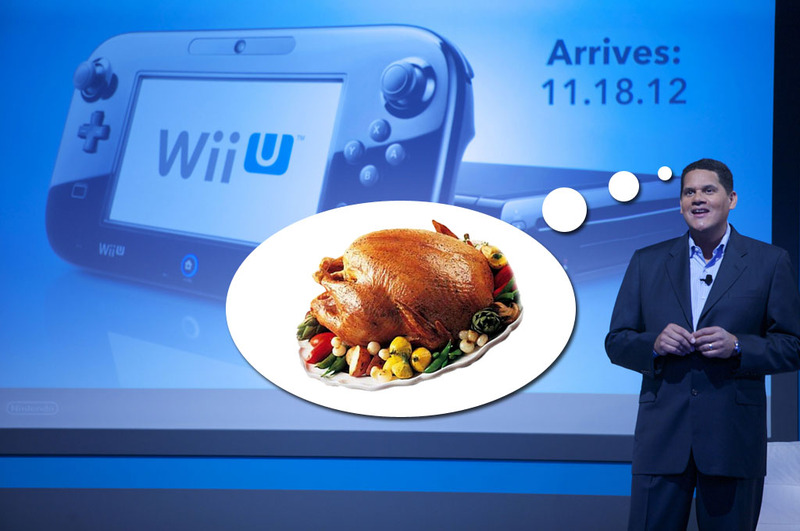 With Thanksgiving gracing the dining rooms of houses tomorrow and into the weekend, it seems appropriate that I speculate what new traditions might arise from the release of the Wii’s successor, the Wii U. It’s a very special Thanksgiving Radio Waves, cranberry sauce not invited! Wii U and your body are ready… for Turkey Day. It’s a well-known fact that the combination of a Wii remote plus Wii Sports multiplied by expensive HDTVs is a recipe for hilarious schadenfreude. What better way to heal life’s wounds than to introduce a controller with a screen of its own? When the TV finds itself punctured to death by remotes, everyone (including dear old grandmother) can gather around the smaller screen to keep that holiday fun alive. Plus, it provides the perfect photo opportunity for those who make their own Christmas cards! Now that’s gaming smart. Nintendo gladly welcomes our second screen overlords. Now that families have had several years to perfect their remote-handling skills, the whole “TV Doomsday” scenario can be avoided altogether by designating any newbie gamers to using the GamePad in the first place. With both hands firmly gripped on that sucker with no need to pretend to hurl it with the fury of a million gorillas, experienced gamers can rest easy. That’s not to say that there aren’t a hundred other disasterous scenarios that could play out under the influence of family peer pressure and too much stuffing. One such party foul is fingerprint smudging all over your fancy new GamePad screen. Be safe and practice safe gaming: wear gloves and respect the property of others. It’ll help that there will be that relative that will gift everyone winter gloves or something stupid and impractical anyway. Real dudes and dudettes hold snow in their bare hands for snowball fights! Whoa, sorry… I’m on a tangent here. Finally, a new shiny console is only as good as the games available on it. Titles like Nintendoland and New Super Mario Bros U are destined to be the reigning holiday champions, demanding the attention of all within the household to play, laugh and scream their true feelings about cousin Barney to his dumb loser face. Always coming in last and losing all his Mario lives faster than Grandpa can fall asleep mid-story. As all launch seasons go, not everyone new game will be a winner. 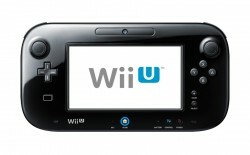 Great, because the Wii U is backwards compatible! Drop the GamePad and everyone get back to playing Wii Tennis like the good old days! Oops, HDTV #6 is ruined now… but I’m most thankful for family being here to witness it. Except stupid Barney. Have a happy Thanksgiving and safe travels, everybody! Warthogs are a Spartan’s best friend. This past weekend, us writers of Horrible Night gamed (collectively) for 24 hours in the name of the Child’s Play charity. While I wasn’t around the entire time (Lincoln is a pretty good movie, guys), I was able to boot up Halo 4 on Saturday night and take part in what might have been the best first-person nonsense of the fall season. There was some traditional matchmaking and I did end a match with over 30 kills and only 4 deaths, but our private games of warthog battles were magic moments to be witnessed. 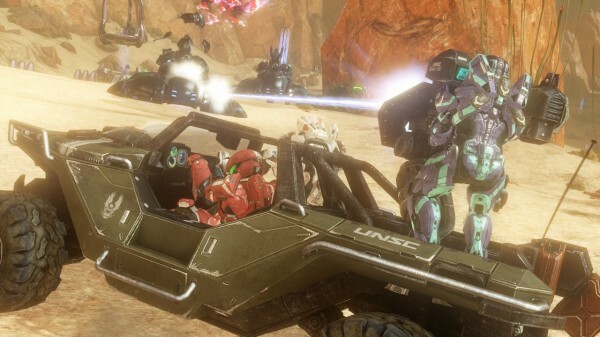 What started as team vehicle-versus-vehicle rounds devolved into free-for-all warthog collisions and roadkill madness. Soon after, our vocal rules went down the drain with rockets and lasers piercing the air when demolished warthogs took their sweet time to respawn. There was also some Dead Island truck shenanigans on Sunday morning as many a zombie, or “flimsy”, was crushed. Thanks again to all who participated and donated in the name of video games, kids and trucks! Don’t Starve – With a title based on pretty sound life advice, Don’t Starve, from the team behind Shank and the excellent Mark of the Ninja, is an interesting take on survival games. It’s currently in beta with regular updates, but there’s high hopes that this evolves into something truly special and delicous. Scribblenauts Unlimited (PC) – If you like the idea of dinosaurs and top hats exploding everywhere the hero laughs from above wearing a jetpack, then I’ve got a great movie script I’d like you to see. The closest thing to that in-game form is more Scribblenauts. Also available on Wii U and 3DS. As always, I’ll be keeping my ears open to the world of gaming and you should too. Radio Waves is a segment where Aaron aka BGRadio takes some time out of his video gaming schedule to reveal his latest game fix, favorite gaming story and mention a taste of what’s over the game horizon in general. It can be whatever you want it to be, except that it’s actually about what I want it to be. That cool? So put on your robe and your favorite fuzzy slippers, let’s chill and talk about what’s currently on the weekly radio.